LARAMIE — Championship. Rinse. Repeat. 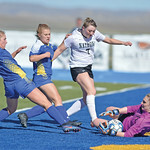 The Sheridan Broncs capped off a perfect season Saturday with a 28-14 win over the Natrona County Mustangs, claiming a third-straight 4A state championship and the 26th in school history. They finished the season 12-0, the team’s first undefeated season since 1992. 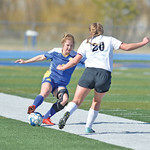 It also marked the sixth-straight win over Natrona, including two consecutive state championship games. Sheridan’s senior class closed out a career with a 34-2 record as varsity players in the blue and gold. Yet, even after winning that many games and three state championships, Saturday’s win put an exclamation point on their careers. It solidified the dynasty that has become Sheridan Broncs football — at least for those who use the term “dynasty” conservatively. 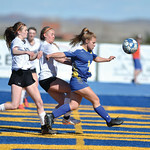 Sheridan needed it from all angles to bring home title No. 26. Against a Natrona foe that ranked higher than Sheridan in a number of statistical categories coming in, the Broncs faced arguably their toughest challenge of the three-year stretch, and definitely their largest hurdle of the season. Even Saturday night, a frigid, tense culmination at War Memorial Stadium, Natrona beat the Broncs — on paper. The Mustangs finished with 444 yards of offense — Sheridan just 169. Natrona had 32 first downs, and Sheridan had only seven. The Mustangs more than doubled the top seed in plays, 99-43. For a Sheridan team that led the state in rushing at 259.3 yards per game, Natrona’s defense put a massive wrinkle in the game plan. The Broncs ran for just 36 yards in the championship. Yet, none of the statistics seemed to hold much meaning. The Broncs walked away with another banner for a gymnasium that’s quickly running out of room on its walls. The game started with special teams in an extra-special way. Sheridan won the coin toss and elected to receive the opening kick, normal procedure for the Broncs. And the Mustangs elected to kick the ball into the arms of speedy Aaron Sessions, often a mistake. Sessions made them pay. He faked a pitch to Kyle Cutis, saw a seam and finished 97 yards later in the end zone. Sheridan would hold the lead for the next 47 minutes and 45 seconds. The defense made plays all night, even when Natrona trudged out lengthy drives. The Broncs finished with 103 tackles to go with five sacks, 10 tackles for loss, two fumbles and two interceptions. One of those interceptions came from Sessions late in the fourth quarter with Natrona threatening to tie. His pick with 3:04 to play broke the single-season record and set Sheridan up for a touchdown drive and a 28-14 lead that would end up being final. “I just wanted to be a difference maker out here today,” Sessions said of his highlight-reel evening. And as it all came together, the Sheridan offense managed to put points on the board, even if it took some trickery. Kyle Custis — Sheridan’s half back — threw for two touchdowns Saturday. The first came on a 25-yard heave to Blake Vigil early in the second quarter — a 14-0 lead. The second happened after a forced fumble against the goal line in the third quarter, and Custis tossed a jump pass to Parker Christensen — a 21-7 lead. The final score of the game came from the starting quarterback, Aaron Woodward, on a keeper up the middle, untouched and celebratory. A few plays later, after the defense forced a turnover on downs, Woodward’s final snap as a Bronc came in the victory formation. The Broncs, as they had done all season long, found a way to win, and not one guy who stepped onto Jonah Field was left out of the fun. That program entered the 2017 season with a target on their backs even larger than the 100-yard stretch of turf at their home Homer Scott Field. 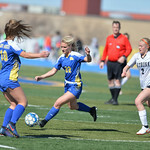 That target got even bigger Saturday night as the blue and gold faithful spilled onto the field and the smallest team in 4A added to its state-best collection of state titles. The Broncs don’t mind. They’ve been here before, and they’ll embrace it once more.